Of all the players who challenged Jack Nicklaus’ supremacy, Tom Watson carved out the greatest legacy. Watson has won 39 events on the PGA TOUR, including two Masters and a U.S. Open and a remarkable five British Opens. 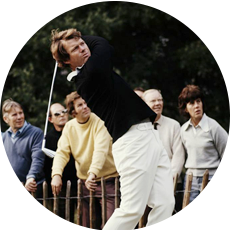 Beginning in 1977, Watson won six PGA TOUR Player of the Year awards, and he led the money list five times. Yet it was his head-to-head victories against Nicklaus, 10 years his senior, that cemented him as a player for the ages. 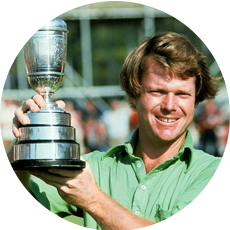 The first came at the 1977 Masters where Watson countered Nicklaus’ fourth-round charge with four birdies on the closing six holes to win by two. Four months later in the British Open at Turnberry, the two engaged in the most intense and highest caliber sustained battle in the history of major championship golf. Tied after 36 holes, they were paired together in the final two rounds. Nicklaus shot 65-66, only to be beaten by Watson’s 65-65. Then in 1982, Nicklaus, gunning for a record fifth U.S. Open, held the lead down the stretch at Pebble Beach. Again Watson counterattacked, finally pitching in for a birdie from deep rough off the 17th hole to produce one of the most dramatic shots ever seen. When he also birdied the 72nd hole, he had won by two strokes and earned his only U.S. Open title. Watson was born Sept. 4, 1949, in Kansas City, Mo. An all-around athlete growing up, the fresh-faced but fiercely competitive Watson was nicknamed “Huckleberry Dillinger.” After a good but not spectacular junior career, Watson attended Stanford, where he graduated with a degree in psychology and showed occasional but not sustained brilliance as a golfer. 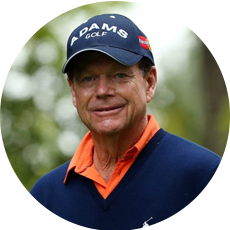 Tom Watson became the first golfer to earn $500,000 in a single season (1980). Still, Watson had trouble winning early in his career. At the 1974 U.S. Open at Winged Foot, he took a one-stroke lead into the final round, only to shoot a 79 that dropped him to fifth. He also led after 36 holes the next year at Medinah but again finished weakly. Watson once said, “I learned how to win by losing and not liking it.” And he also learned from Byron Nelson, who later became his teacher and mentor. Although Watson was a long hitter who had frequent streaks of superb ball striking and birdie runs, he was even better as a scrambler who could manufacture good scores with what became known as “Watson pars.” During his reign as the best player in the game, Watson was a fearless putter who frequently ran birdie chances well by the hole, but seemingly never missed the comebacker. After his glory years ended with his last money title in 1984, Watson’s putting declined and he won only three times since.